As I wrote with the T-37A kit review (Kit No. 83821) of all of the early Soviet tank designers, probably the luckiest man of the lot was Nikolay Aleksandrovich Astrov. He was a promising young engineer at a lamp factory in Moscow when he was arrested as an “enemy of the people” in 1929. Sent to the formidable Butyrskiy Prison, he was soon fortunate enough to be sent to what the Soviets called a “Sharashka” - a design bureau working for the OGPU that provided better treatment than the prisons did. While there he showed a flair for armor design by creating the PT-1 and PT-1A amphibious tanks; while they were not accepted it did lead to his release from prison in 1934 and return to more serious tasks of tank design. 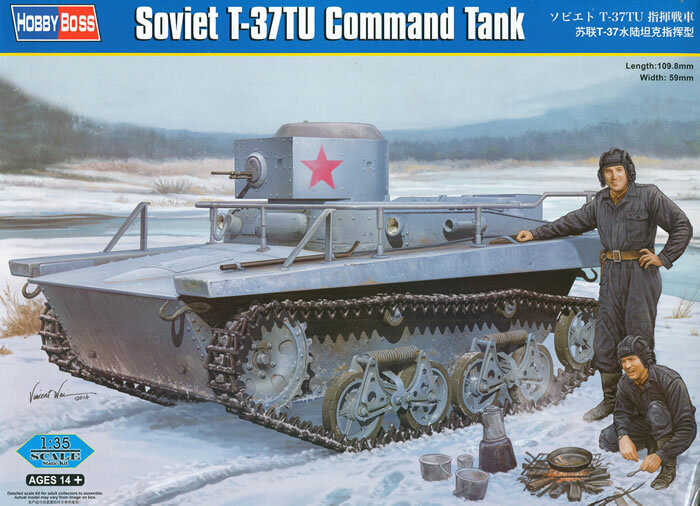 Assigned as chief tank designer at the Izhorsk factory, one of his first tasks was taking the T-37A light amphibious scout tank designed by OKMO in Leningrad and getting into production at their plant. Astrov changed a number of the less desirable features of the tank, such as adding tapered floats to the fenders to give it more buoyancy in the stern and other changes. In 1935 he totally redesigned the T-37A and came up with the superior T-38 tank. 2,356 T-37 tanks were built at Izhorsk including 75 chemical tanks (e.g. flamethrowers) and 436 radio/command versions. All but about 300 were produced under Astrov’s control. A number of years ago LF Fort from Ukraine produced a kit of the T-37A radio tank with its distinctive “handrail” antenna. That kit had 294 parts, all in grey styrene, but as many kits of its vintage was produced by early eastern European methods meaning multi-part hulls and turrets, “short shot” parts, and some just plain simple molding. Like the T-37A this kit (which shares most of the same parts) is a state-of-the-art kit with a one piece hull tub and one piece turret shell with first-rate molding. While it unfortunately retains the concept of single link tracks, they are crisply molded on seven sprues and foam packing is provided between each sprue to protect the delicate teeth on the links. Note that the TU term normally is used for radio controlled tank controlling tanks (TT is the “robot” one controlled by radio) and that actually this is just a radio-equipped tank. The Soviets generally referred to them as “line” or “radio” tanks in service. Each bogie consists of 11 parts and comes on its own sprue; the bogies come with styrene springs but then again it does make for a simpler build. The etched brass in this kit is used very smartly (about time, HobbyBoss!) and covers the parts which benefit from it. These include wave deflectors at the front, muffler straps, and the engine intake grating. There is no interior in the kit but it comes with a very nice and petite DT machine gun and ammo disk but no details inside the hatches. As this is the radio version of the tank it comes with the unique rail assembly in one single piece and its six support arms that provide clearance for clean operation of the radio. Three finishing schemes are offered: parade vehicle with 4BO green with a red turret stripe; overall whitewash with red stars; and a brown over 4BO green camouflage with a white cross on the turret roof. A sheet of decals provides the stripes, cross and stars. Overall this is a really nice kit but like the T-37A for tracks this petite HobbyBoss should think about link-and-length configurations.